Due to the proximity of Paris as well as the new Parisian waterways and the railways links to the Parisian markets, Les Grands Moulins, an export flourmill Company migrated to Pantin in the early 1920s. Haug and Zublin, two Dutch architects built an eight-floor mill-building for the company. This Alsatian-inspired very high architectural building was characteristic of flourmills of the early twentieth century. During the peak season and at the highest of the work-period, 190 000 tons of flour were produced annually in Grands Moulins. It was one of the first flourmills in France. Badly damaged in the Second World War, the building was partially reconstructed by the architect Leon Bailly. The owners of Grands Moulins de Pantin, Soufflet company group, put an end to the flour milling industry in June 2001. 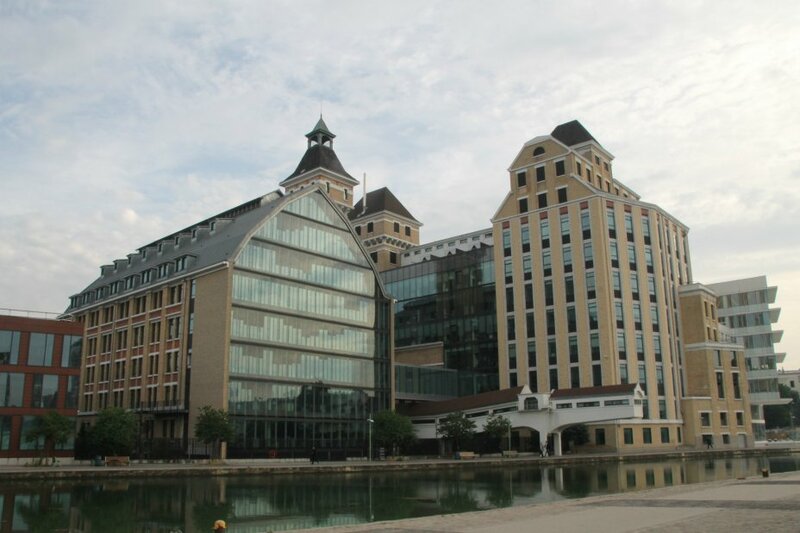 After that the mill was purchased by Meunier Estate agency which was a subsidiary company of the group BNP Parisbas, they decided to transform the mills structure into offices for the bank. The architectural Reichen and Robert group won the competitive contest in 2003. They planned an ambitious choice to combine modernity and history for the restoration concept. Construction began in May 2006 and was delivered in September 2009 to accommodate more than 3 000 employees. The first layout of the construction of the new building must optimize the current site in a logical development of the “big old mill” that contained the flour mill, silos and the old mill boiler-room as well as the pinwheel. The stratification that determines a logic composition of the heights of the buildings as well as the perception in the environment landscapes and its importance. Those simple basic lined up mills keep their amazing imposing figure of the three towers and large framed roofs, typical gable framed style. The boiler made of firebricks which are able to withstand severe heat was transformed into a cafeteria and the old machinery room remains visible in the middle of the glass building structure. Two grain elevators were demolished and a third silo which overlooks the canal was rehabilitated. Windows were opened in the high concrete structure covered with red bricks. 1950s semolina mills which was demolished, has been replaced by a simple three storey building. The brick is clearly the main characteristic material component which was emphasized in preserved and contemporary buildings. One of the major reflections brought to light by the architects was the density of the site; it was a fulcrum balance between old and new with absolute respect of the original spaces as well as the appropriate part of the solution to the needs of the sponsor. Numerous devices for services to employees are provided such as two restaurants, cafeterias, medical office, library, gymnasium, patios, gardens, art galleries as well as a parking of about 760 places. Part of the global scheme project of the urban land settlement planning is the transformation of the neighborhood: the landscaping and pavement of the banks of the Ourcq Canal and tertiary development with the implementation of tramway T3b in 2012. An artwork gateway was created above Ourcq Canal to allow tramways, cyclists and pedestrians to cross. Discover more information about industrial heritage in the Seine-Saint-Denis department.